When your husband tells you that the dish you’ve just served is one of the top five best of all time, you probably ought to write down the recipe. When I first started making dinner tonight, I wasn’t necessarily going to blog about it. I did take some pictures but that was more because I just received a new (old) lens in the mail and wanted to play with it and the new natural light we get now that Spring has sprung forth. 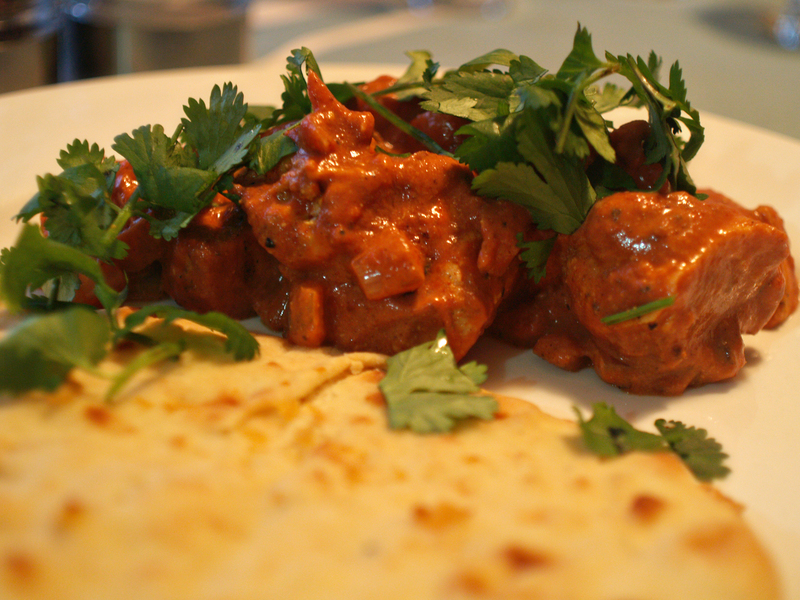 I first tried making my own chicken tikka masala back in January of 2009. Since then, I’ve used various jarred sauces along with variations on spice mixes and pastes to make marinades, trying to move ever closer to “perfection” as described by Chris, the lover of all things tikka. Some of the sauces have been closer than others but each time, either the marinade or the sauce was off (plus there was that one time I used vanilla yogurt instead of plain- not that Chris seemed to notice). Short of buying a tandoori oven, I didn’t really know what else to try*. Truthfully, I don’t know what I did tonight that made it work so well but I’d like to think it was using yogurt in the sauce (healthier too!) and the almonds. 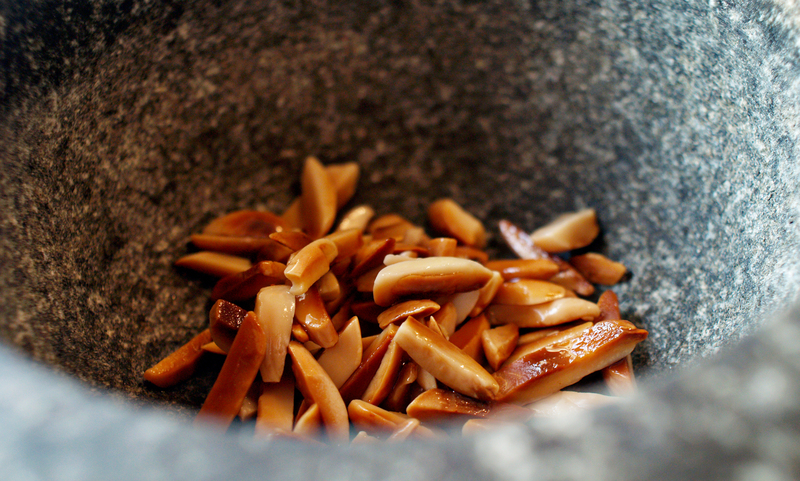 Over medium heat, toast almonds (in a tiny bit of oil) until lightly browned and fragrant. Set aside to cool. Either grind in food processor or use a mortar and pestle if you are feeling particularly aggressive. 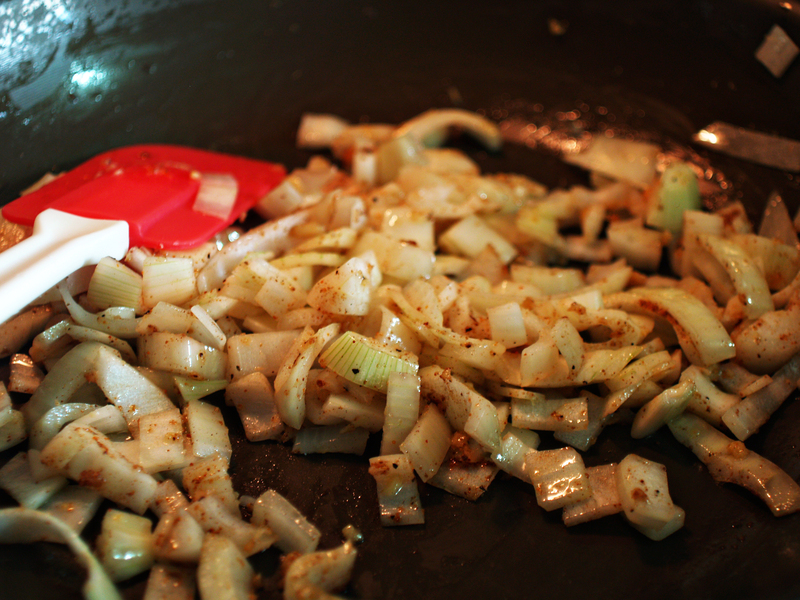 In a large saute pan, heat one tablespoon oil over medium-high heat. Add garlic, ginger and onions, cooking until they look that picture up there at the top (softened but not browned). Add half the garam masala and cayenne pepper to onoins. Stir to combine and continue to cook for two or three more minutes. Meanwhile, you can put your chicken on the grill or broiler about now. Add tomato sauce, ground almonds and remainder of spices to the pan. Reduce heat to low and allow the flavors to meld. When chicken is done, cut in to chunks (if you didn’t already) and add to tomato sauce along with the remaining yogurt. Mix to combine, heat through and serve. We had our with store-bought garlic naan. Garnish with fresh cilantro, of course. Also would be excellent with rice or quinoa. I recommend a bit of raita too as this version turned out fairly spicy. *I have looked in to purchasing a tandoor. Looked as in glanced. Amazon sells them, for a couple thousand dollars so that is clearly out of the question. Right? **I wish I could remember exactly where we bought this. Maybe Whole Foods or I just saw it in some random store. You can get it online if you follow the link in the ingredient list, though. Posted on March 15, 2010 March 15, 2010 by genie28Posted in Poultry, recipesTagged chicken, Indian, perfect, top 5.